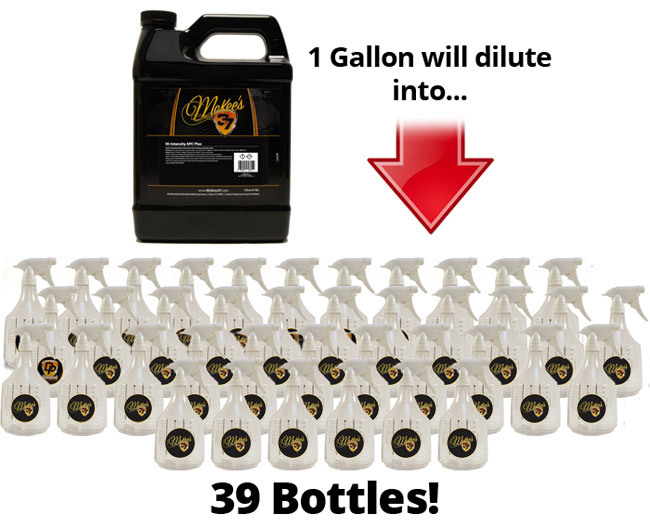 Money-saving combo includes two gallons of McKee's 37 Hi-Intensity APC Plus and a 36 oz. Ounce Detail Bottle with sprayer! Just wanted to tell you how awesome your APC cleaner is! I just ordered the two gallon combo from Auto Geek and wow I don't have to hold my breath when I use this cleaner. If you are looking for a new APC then look no further then Mckee's, this stuff has the power to cut through any dirty job. Look forward to trying more of your products! - Dustin D.
McKee's 37 Hi-Intensity APC Plus provides all the premium characteristics of a high-end all purpose cleaner at a much lower price. Formulated for the detail shop that uses APC like a race car uses gas, Hi-Intensity APC Plus is a versatile, cost-effective all purpose cleaner that you can rely on to clean almost every automotive surface. McKee's 37 Hi-Intensity APC Plus forgoes harsh chemicals that are harmful to you and the environment and instead relies on smart chemistry. McKee's 37 Hi-Intensity APC Plus is strong enough to remove grease from engine bays, yet gentle enough to clean fine leather upholstery at the proper dilution ratio. McKee's 37 Hi-Intensity APC Plus leaves behind a fresh citrus fragrance inside the vehicle. McKee's 37 Hi-Intensity APC Plus will not leave surfaces sticky, regardless of the dilution ratio. When a powerful cleaner is needed for engines, tires, and fender wells – dilute 4:1. For light to moderate dirt and grime inside the vehicle, dilute 10:1. Feel free to play chemist in your detail shop and experiment with the dilution ratios! No matter the dilution, McKee's 37 Hi-Intensity APC Plus will not leave a film on the surface. McKee's 37 Hi-Intensity APC Plus is a great value, and it allows you to simplify your detailing process. You’ll save a ton of money because McKee's 37 Hi-Intensity APC Plus replaces an entire shelf of various cleaners and degreasers. Contains two gallons plus a 36 ounce detail bottle. One of the best deals on the internet. Pros10:1 dilution is edfective on most interior surfaces Bottle included. ConsOnly con I can think of is this product is scented. Don?t see this as an issue until I get a customer with chemical allergens. Loving the APC, even diluted 1 to 1, more than strong enough for the toughest dirt and grime. Not a fan of the spray bottle, due to a hand injury doesn't work very well for me. regarding it's ablity,Watch your formulas and you'll be fine.